....that you can already buy tickets for Mickey's Not So Scary Halloween Party when you call Disney. I bought ours for fear that the party will sell out. ....to be writing a blog post on how to RSVP properly soon. Natalie's birthday party turned out okay, but it was a bit of pain not knowing who was coming. Two people just showed up without RSVPing and it's a good thing we still had room for them. ....to be glad Natalie had a great birthday. Her real one was Monday, March 19th. I joined her for lunch at school and then she wanted pizza for dinner. No one in my family ever asks me to cook a special meal because I burn stuff. ....to have not done much for St. Patrick's Day. It was Natalie's birthday party, so we did that, and then came home and relaxed basically. No corned beef. No drinking. 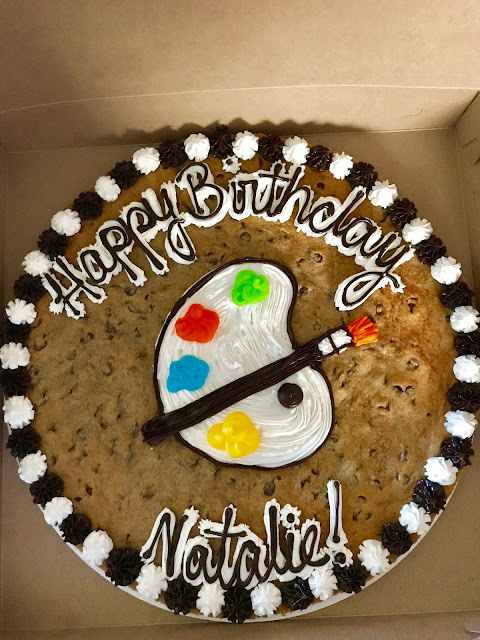 ....to have bought Natalie a cookie cake from Great American Cookie because again, I am TERRIBLE in the kitchen. this is a great blog. Gives people a chance to "air out their dirty laundry"
I love cookie cakes. I buy them just because. Not properly RSVPing is a giant peeve of mine. I love cookie cake. I love your blog posts. I would have bought my tickets early, too! The Disney parties DO sell out quick, so that was smart. So weird that people didn't bother rsvping! I made sausage and cabbage for st Patrick Day. People swear don’t know what RSVP stands for. I'm always frustrated over the RSVPs. People are so rude, I can't stand it! That cookie cake is so cute and they always taste so good. Any shortcut that saves me time when planning a party is a good thing. I did ZERO for St. Patrick's Day and I am not in the least bit upset over it! LOL! It's just not my kind of holiday what-so-ever! Oh my gosh, I LOVE this idea and might have to borrow it for a future blog post. I'm doing to Disney World this weekend (and then back in August for a week + a Disney Cruise) and I can't believe tickets for the Halloween and Christmas party are already on sale! That cookie cake looks amazing! I think I rather eat that than cake itself. I had no idea you could buy tickets this early for a Halloween party at Disney! Smart move! Birthday party RSVPs are such a pain! I hate not knowing how many people are coming to my kids' parties, but then I find myself forgetting to RSVP until the day before the party sometimes. I love that texting has made it so much easier to RSVP. If I could buy a cookie from the Great American Cookie every day, I would. So yes, it's totally okay that you went on and made that purchase! I love Natalie's cookie cake! I did not do anything for St. Patrick's Day this year. I typically don't. I would love to have the ultimate St. Patrick's Day experience one year though. Hey there's no shame in buying a cake from the store. I do that too. Its convenient and always delicious. The cake you chose is really cute! What is amazing is that my latest post was about our successes (the small ones). My post asks that you list what you've been successful with. It's so great to be okay! It's go good to site back and sigh relief that things are REALLY OK. Thanks! Yay for buying tickets already to the Halloween party, I would have done the same thing. Haha don't worry I am terrible at cooking so I would have definitely brought a cake as well. I love the cake that you had brought for Natalie's birthday and I bet that it was delicious too. Glad Natalie had a blast and I'm sure she loved that cookie cake as well. I think people should really learn how to RSVP so hosts won't have such a tough time! It's sad but true that people need to learn how to RSVP to something properly. It is so incredibly annoying tracking down people, or people showing up unexpectedly. So stressful! We didn't do much for St. Patrick's Day either. The kids wore green as well as me but that's about as far as it went. My St. Patrick's Day went average too. I just tried a new recipe of cake. My health didn't allowed me to work further.. The cake looks amazing. I can't wait to read your RSVP I think it will be funny. Beautiful read. You have jotted down some cool info not to worry about in life. I think that RSVP post is a must because people don't usually follow it these days. It's nice that Natalie had a lovely time celebrating her birthday though. I love that cookie cake that you bought. Yes to the RRVP! My daughter just had a party over the weekend and we had 3 who didn't RSVP and two of them brought siblings! Luckily the space allowed for the people, but it would be nice to know. For my other daughters party we didn't get a single RSVP until the day before and then got most of them the day of! Crazy! I'm also looking forward to the RSVP post! Huge pet peeve. Wouldn't others want to know if their guests are coming or not? Simple courtesy..
Natalie's cookie cake looks yummy. Can't wait to read about Natalie's birthday party. The cookie cake looks delicious. I need sweets in my life. It honestly sounds like you are way ahead of things. That is always a good thing! That cookie cake is on point! I could use more of it in my life!! Tis a beautiful cookie cake! I'd do the same. My kids think I'm a good cook but I'm terrible! I just heat frozen stuff really well and then present it better. That cookie cake turned out so cute! They did an awesome job! Oh how how awesome is that cake! Awesome idea for them to have done! Your daughter's cookie cake looks really cute and yummy to eat! I can't wait to read your post about how to properly RSVP soon. My daughter wants one of those cookie cakes from the mall cookie place so bad. I should probably surprise her this year with one. Happy Birthday Natalie! I hope you had a blast! I so love the paint related design. Simple and unique. Will definitely be looking forward on your post about the RSVP thingy. I have missed reading these posts recently. Don't know how I have missed them. Ah well. It is ok to buy tickets to Mickey's Halloween Party early. They sell out months in advance which is kind of silly because they don't start putting the ads out on television til like month before or so. And if all the tickets are sold out by then (and they have been), why put out ads for it at all? Only will frustrate people. Best to do it in advance if you can. Love the cookie cake idea, even for grown ups! I don't go ll out for St.Patricks day sometimes too. I usually jut but a green bracelet on and call it a day! Lol, thanks for sharing. Hey It's Okay to have spent the 1st 3 days of your kids' Spring Break out of state on a business trip OR at least that's what I kept telling myself. I hated being away from them but I had to work.